With the January 1 free agency looming for much of The Elite, many within the group have potentially worked their final match for ROH. The success of “All In” and the rumored All Elite Wrestling promotion that looks to be on the horizon, point towards Cody Rhodes, The Young Bucks, and Adam Page possibly heading in a new direction. 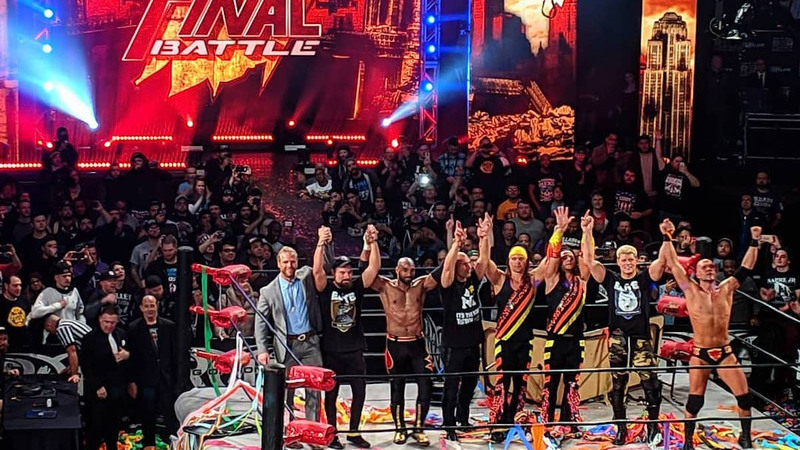 In the video above, after last night’s ROH Final Battle PPV finished up at the Hammerstein Ballroom in New York City, the Young Bucks, Rhodes, Page, and Marty Scurll gathered in the ring to address the live crowd. The Young Bucks noted the Hammerstein Ballroom was their favorite place to wrestle and invited Scorpio Sky and Frankie Kazarian in the ring, Christopher Daniels would join later. Matt would then give props to Cary Silkn, ROH COO Joe Koff, and ROH GM Greg Gilleland for their support over the years. He gave a shout out to the other wrestlers in the back, his wife, and the fans. The group then linked arms and did a quick pose for the crowd before heading to the back. Matt’s tease of returning was kept pretty vague, whether that means they show up at the ROH / NJPW G1 Supercard on April 6 or something completely different, we may have to wait until that timer gets to zero on Being the Elite.